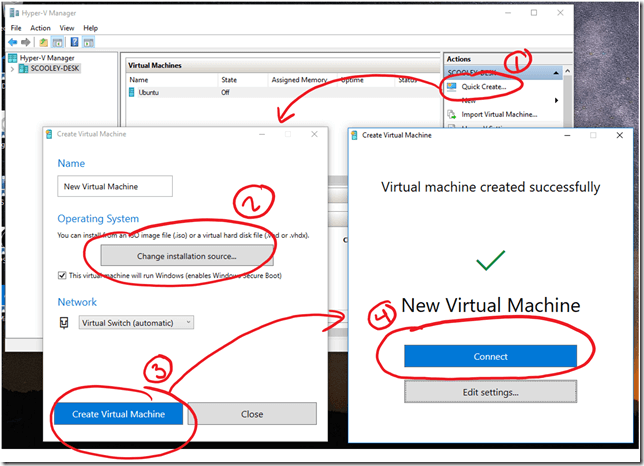 Hyper-V Manager has a new option for quickly and easily creating virtual machines, aptly named “Quick Create”. Introduced in build 15002, Quick Create focuses on getting the guest operating system up and running as quickly as possible — including creating and connecting to a virtual switch. 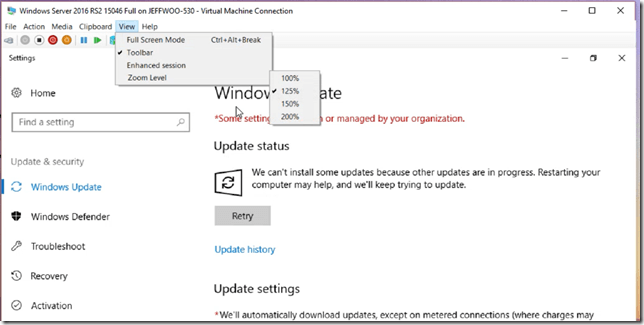 Last year we added the ability to run Hyper-V inside of Hyper-V (a.k.a. nested virtualization). This has been a very popular feature, but it initially came with a number of limitations. Is your virtual machine impossible to read? Alternately, do you suffer from scaling issues in legacy applications? VMConnect now has the option to adjust Zoom Level under the View Menu. NAT networking is vital to both Docker and Visual Studio’s UWP device emulators. When we released Windows Containers, developers discovered number of networking differences between containers on Linux and containers on Windows. Additionally, introducing another common developer tool that uses NAT networking presented new challenges for our networking stack. Developers can now use for multiple NAT networks (internal prefixes) on a single host. That means VMs, containers, emulators, et. al. can all take advantage of NAT functionality from a single host. Developers are also able to build and test their applications with industry-standard tooling directly from the container host using an overlay network driver (provided by the Virtual Filtering Platform (VFP) Hyper-V switch extension) as well as having direct access to the container using the Host IP and exposed port. Until recently, Hyper-V has allocated memory very conservatively. While that is the right behavior for Windows Server, UWP developers faced out of memory errors starting device emulators from Visual Studio. In the Creators Update, Hyper-V gives the operating system a chance to trim memory from other applications and uses all available memory. You may still run out of memory, but now the amount of memory shown in task manager accurately reflects the amount available for starting virtual machines. SOURCEWhat’s new in Hyper-V for the Windows 10 Creators Update?